This picture is an obvious interaction with the land. They are planting gardens, thus making their environment more beautiful. This depiction of Mary and the Christ child was a type of Byzantine art, so obvioulsy those cultures interacted. It was also a way of developing their own culture. It shows the great love the Christ child and Mary share, a key part of both the Roman Catholic and Orthodox Christian faith. 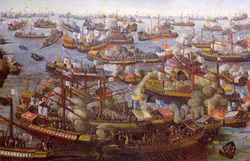 The Battle of Lepanto is a very important battle in history. It is the first battle the Ottomans had lost of many. Notice the amount of ships-it is believed those belonged to the Ottomans. This picture of Ivan V shows him ornamently decorated. This shows how rich the Russians were, or at least appeared to be. At the very least, they spent a good amount of money on their leaders. Peter the Great is responsible for starting the movement of Westernization in Russia. This was a revitalizing movement. In this picture, you can tell he is a reveared, respected leader of Russia.